After checking up on the progress of the new California Fish Grill every time I drove by on Barranca, yesterday I finally saw its sign lit and a "Now Open" banner flapping in the breeze. Finally, Irvine has it's very own "fast-casual" fish restaurant, where I can get a decent grilled fish dinner for no more than $10. For a while, Malibu Fish Grill in Santa Ana was a fine substitute, the closest alternative available when I didn't feel like driving to California Fish Grill's other stores in Anaheim Hills, Cypress, or Gardena. But it wasn't close enough. I wanted something even more local; something I didn't have to jump on the freeway for. And now I have it! With an average meal (complete with fries and coleslaw) just hovering around $8, it's unfortunate that they didn't decide to open here sooner. At this price, you'd be lucky to get away with a small appetizer at The Fish Market over in the Irvine Spectrum. And let's not forget tip and the Spectrum parking zoo. And The Fish Market's food? Fuggedaboutit! Nope. California Fish Grill's got everything I need. A good seafood meal for about the same amount of money I would pay for a burger and fries, served in a reasonably chic and clean environment. The brand new Irvine store is definitely spiffy and sleek. 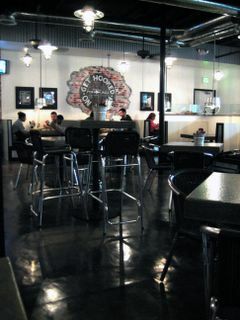 Although the polished metal chairs, exposed aluminum ducting, and the steel buckets stocked with condiments make it look like the Tin Man from Oz used to live there, the large plate glass window looking into the open kitchen was a welcome sight. The better to spy on how your food is prepared! And once you decide, you'll be asked whether you'd prefer garlic butter or Cajun spices to top it, and if it will be fries or rice. Then you pay. You get a placard with a number. And you pick your own table and wait for the food to be brought to you. 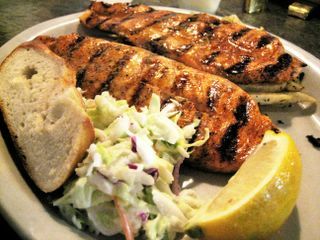 The Grilled Salmon I ordered from the specials of the night ($7.99) included not one but two long filets of the fish, shiny and lacquered with a vigorous dusting of Cajun spices (a.k.a. "bammage") over a handful of shoestring fries. On the side; a crusty and dense slice of sourdough and a small scoop of tangy coleslaw. The fries, tossed with salt and dried parsley, could have been more crisp, but the salmon was cooked perfectly. The flesh of the fish was still moist and buttery while the char marks added a smoky note. The Cajun rub wasn't overpowering, offering just the right amount of punch. 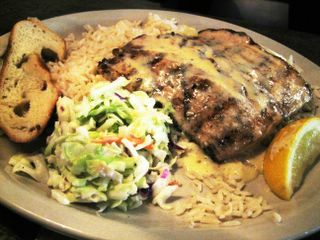 The Grilled Mahi Mahi ($7.45) was just as good. The light, flaky fish was creamy and subtle. The top was slathered in a melted butter sauce infused with garlic. All of it went beautifully with the faintly nutty rice pilaf served underneath. But all isn't perfect yet at this new outpost. The salsa from the self-serve bar is inexplicably bitter, and the credit card machines didn't seem to work that night (bring cash). Regardless of these minor kinks, I'm glad to have found Nemo in Irvine. "Fish are food, not friends!" Those prices + your detailed descriptions of the food make my heart ache for Southern California life. . . I wish there was a place that served fish with prices like that up here in the Bay Area! Plus, it seems like they cooked the fish so it wasn't too tough and dry, but still moist and tender. Dang. Sounds delicious Elmo. yes, always remember "fish are food, not friends!" and also remember, if you can't seem to find that perfect fish restaurant... "just keep swimming, just keep swimming, swimming, swimming..."
oh god, the references are going crazy!!! i could seriously do this all day. make "finding nemo" references all day and all night. just keep writing them down and make this comment as looooong as possible. i don't even know if you liked your food or not at california fish grill. all i know is we have to find nemo!!! oh, damn, have you seen my son?? his name is nemo!! his has a gimp fin and, crap, he's probably shark bait by now!! oh well... when's happy hour? J. and I will have to check that out. There is nothing better than a super cheap (by OC standards) meal. As for Irvine Spectrum parking... *shudder*. I usually increase the sedative medication an hour before attempting to park there. Great review as usualy, elmo. I noticed it opened. Going there this weekend for sure. Doesnt hurt that its practically walking distance from my house. Hey Elmo - The prices sound great. Most "affordable" fish places(unless they deep fry them) still overcook fish, to an dry, tasteless mess. Well, seeing as you guys have so many enviably fine restaurants and Napa/Sonoma Valley within driving distance, I'd say it evens out! That cracked me up! You're certainly no Mr. Grumpy Gills. "Sea monkeys' got my money"
"Oooh...this is gonna be good! I can tell!" This is just the place for a casual dinner. Let me know what you think! I didn't mention it, but they do fish tacos and fried seafood also. For those who dislike all things oceany, there's TWO, yes, TWO chicken items they can order. Chicken burrito or taco. I think it's a great addition to the neighborhood. I can't say the same for Panera Bread next door. I know what you mean. I hope this one keeps it up. Nothing worse than an overcooked piece of fish, except an overcooked piece of steak. Ooooo...FISH! Now I have a new answer to "What's for dinner." Everyone in my family, except for my sister, loves fish, so this will be a great place to try one of these days! Also because it's close to home. Dangit, how old are you guys? And you make "Finding Nemo" references? HAHA. On a related note, my physiology professor is the "Fish Guy" at the end of the credits in the movie! How awesome is that?! I can't speak for Eddie, but although I can buy booze and lottery tickets (I *always* get carded), I can probably recite lines from all the Pixar films like the geekiest 10 year old. I heard about that Fish Guy from the UCI Alumni Newsletter! That is cool that he was your prof. I also love to EAT the little fishies! heehee! I know where to go for some good cheap seafood eats if I'm ever down in the OC. LOVE the prices! heehee! I heard about this place a few weeks ago and didn't know exactly where on Barranca it was so figured it was just some place I hadn't been aware of. Now that I know it's open and almost within walking distance I'll be trying it soon. On another note, I stay away from the Spectrum now because of their horrendous parking situation. I e-mailed somebody over there about it but right now I'm too tired to relate their response. The small fishies are the tastiest! And they've got tacos and burritos! Right up the alley for you blog. "And they've got tacos and burritos! Right up the alley for your blog." Really? Very cool. I might end up there in the next day or two then. love your reviews!! i'm in Anaheim Hills and frequent the CFG up here...I usually really like the fries here, but they'll also let you sub in yummy grilled zucchini if you're feeling new-year's-resolution-healthyish! I'll be checking your blog in the coming days, should you decide to review it. Thanks for visiting! I didn't realize you could substitute those grilled zucchinis for fries! They look excellent. Was actually going to add one for $.99 to my meal, but thought my plate was big enough. Substituting would be perfect. Thanks for the tip. I headed over there immediately on Thursday as soon as I read that they have tacos and burritos there. Great food blog. I enjoyed your reviews. Thanks. I also made a second visit last night. Had the White Roughy with fries, and I must say the fries were excellent this time. Hot, crisp, and perfect. Thanks for the comment and the compliment! Come back soon! I had the fish taco special just after they opened. I agree that the salsa is very bitter. The fish in the tacos was fresh and tasty, but for some reason they chose to over salt them. Why do people kill perfectly good food with salt? I was expecting more from the side dishes. A big minusm there. However, the grilled fish may still be worth the other pitfalls. As for the sleek decor, I would mention the two flat screen TV's so tiny as to be subliminal. It reminded me of that part of the movie Spinal Tap when the tiny little stonehenge replica is lowered from above and there is this look of disbelief on the faces of the band. Someone should have popped for bigger TV's or just left them out entirely and opted for good music. Thanks for the post. Liked what you said about Spinal Tap. It reminds me that I still have to watch that movie from start to finish, not in snippets like I have. As for CFG, I'm still waiting for them to correct whatever is wrong with that salsa. The trout was the best I've had in a long time. For $8, you can't beat it. For $12 you can't beat it. It is a bit of a hike from my office, but we've been there twice for lunch. Well said...CFG is damn economical for what you get! What everyone is saying, the pricing and the quality makes this a hit! I recommend the roughy and the deliciously rich clam chowder. I've only tried the Cajun spices, as the garlic butter sounds like a welcoming to a heart attack. Too bad it closes at 9pm. After hearing about CFG from an employee from my work, I have eaten at the Irvine CFG twice in two days! It is sooo yummy. Elmo, great job with the reviews. Yeah, I wish it were open until midnight. But then barely anything in Irvine is open past 9 pm. I'm glad you've discovered CFG. It's one of those places that actually make sense and is perfect for Irvine. Good food, cheap prices, clean environment. I must admit that I am addicted to their fish tacos (the battered ones). I have eaten many fish tacos in my lifetime at various authentic mexican restaurants around Santa Ana, Costa Mesa, and Orange. These are my favorite for some reason. I guess we all have different taste buds. Ha! In addition, I have no problem with the salsa that is put on the tacos. I think that the "bland" salsa flavor brings out the flavors of the fish. Just my opinion. I love this place, I also live close & have craved fish at a reasonable place. I can just walk in & eat even alone. Hey, lets form a group, can't believe some of us all live so close! I've yet to try their fish tacos, but I definitely will soon. For some reason I thought they were grilled (which I think is no good for tacos), but now that I know they're fried, I'm sold. What's funny is that we've all probably run into each other in Irvine and didn't even know it!